Ancient Romans built some spectacular bridges, and a number of these are still standing today. 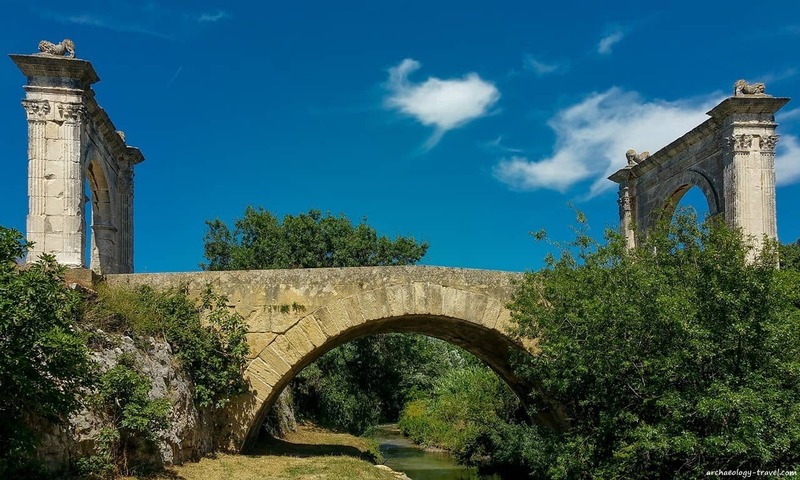 One such bridge, located somewhere in the decidedly unassuming southern approach to Saint Chamas of central Provence, is said by many scholars to be the most beautiful Roman bridge outside of Italy. A bold claim. 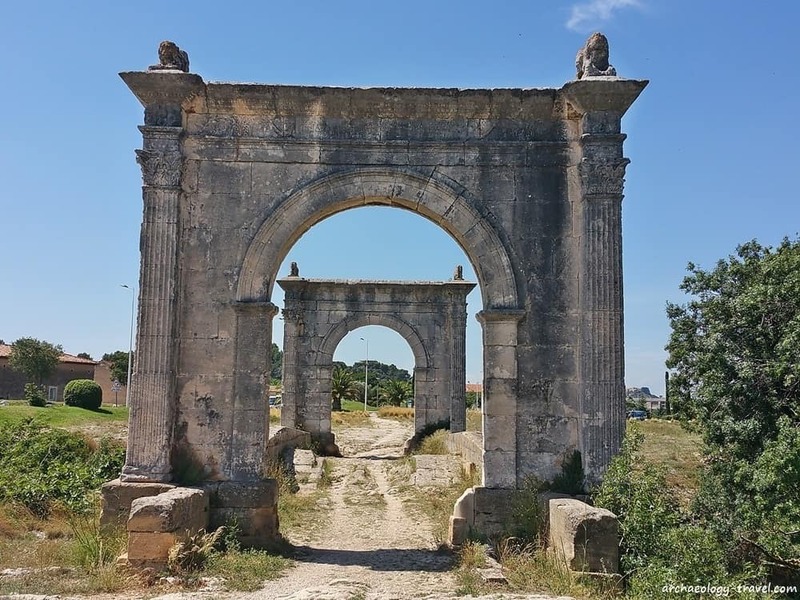 During my recent trip to the south of France I had a few hours to spare one afternoon and headed over to St Chamas from Nîmes to see what all the fuss was about. Were it not for the two triumphal arches at either end of the limestone bridge, you would drive by unaware of the quite well preserved remains of the Roman bridge. There is very little to indicate its presence. The Touloubre River, over which the bridge straddles, is a natural boundary for the urban spread southwards of St Chamas. On the southern side of the river are various semi-industrial areas, and the town’s athletics stadium. The ancient roads are still etched into the ground and are clearly visible from above (see the Google map below), but have long since been replaced by more modern tarmac roads and round-abouts. 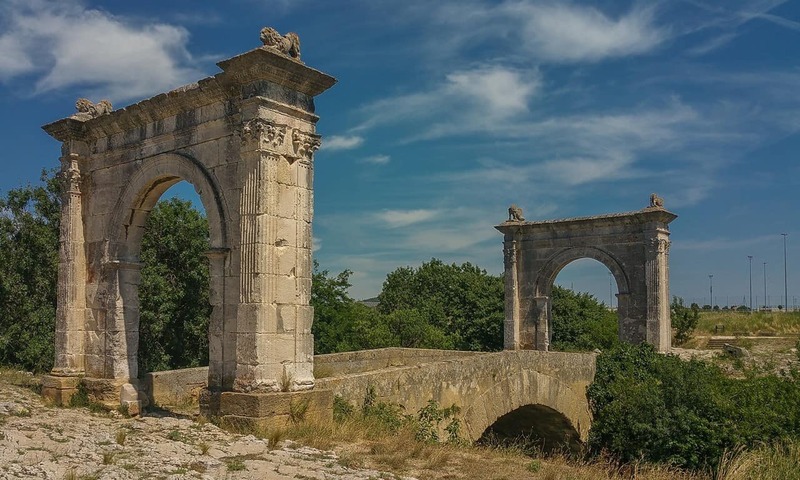 Although the bridge was constructed using yellow limestone, the two triumphal arches were made with white limestone; the difference is immediately obvious. Despite this difference, because the bases of the arches are in yellow limestone the bridge and the arches are in all probability contemporary. The stones that make up the arch must have been lowered into place using a crane. And as such Le Pont Flavien is a good example of refined Roman engineering. The arches are made up of matching, fluted pilasters that end in Corinthian capitals that support a decorative entablature. Above the capitals are reliefs of eagles, their wings half-spread and their claws clutching a wreath that stretches from one side to the other, linking pairs of eagles across the entablature. At each the ends of the two pediments are four carved lions. Only one of these is original, the right hand one looking at the arch on the southern bank (the right hand lion in the second photograph above). This one is noticeably more worn and eroded than the other three, which are eighteenth century replicas. They were replaced when the northern arch collapsed and was rebuilt in 1763. Lucius Donnius, son of Caius, Flavos, flamen of Rome and Augustus, has ordained in his will that [this monument] be built under the direction of Cauis Donnius Vena and Caius Attius Rufius. The inscription is the only source of information we have about this monument. But it clearly indicates that the bridge was built for Flavos following his death. 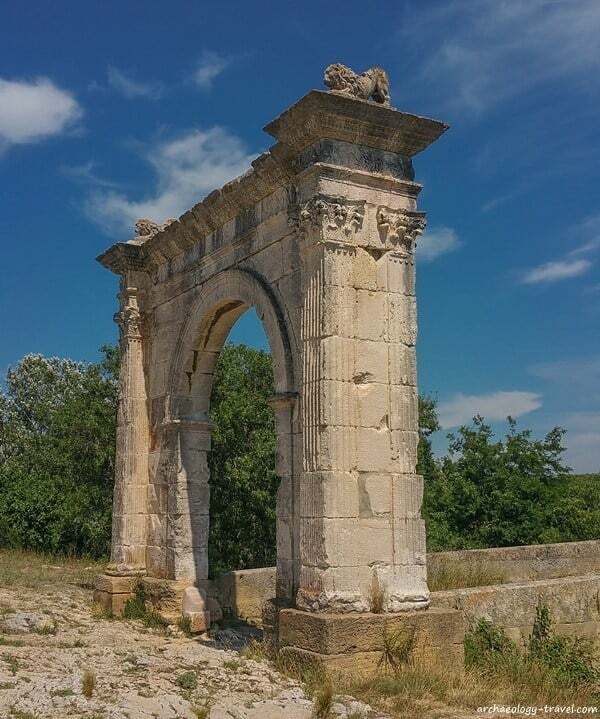 The lack of triumphal imagery normally associated with Roman arches is not surprising given this was a private monument. The iconography we do see strongly hints at a funerary association. The foliated scroll (clearly seen in the photograph directly above, the inner face of the southern arch) between each pilaster is a pattern that is thought to have symbolised the constant rebirth of life. Also, eagles and lions are common themes found on tombs. Archaeologists believe Flavos’s mausoleum would have been nearby, which almost certainly would have carried his portrait. Unfortunately no such tomb has been found in the vicinity. From the inscription we know that Flavos, a flamen or cult priest, served the imperial cult and was almost certainly a Romanised Gaul. 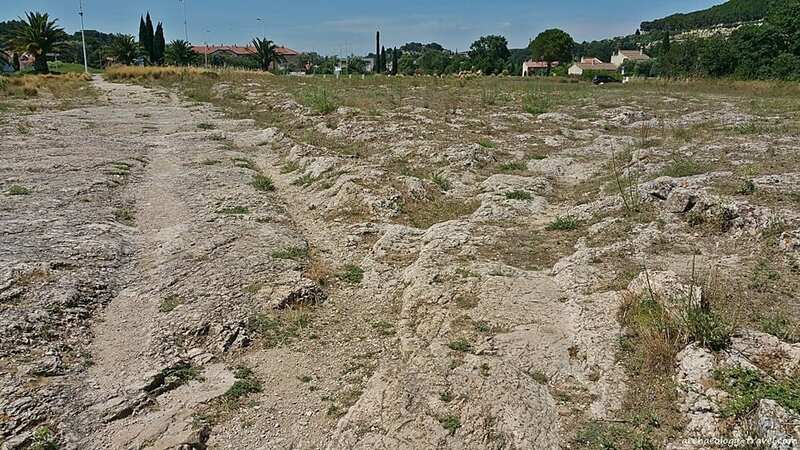 Given he could afford to have Le Pont Flavien constructed in his honour suggests he was a major figure in the local Avatici tribe, and he probably owned land here. The bridge with its delicate arches was an architectural statement to all who travelled the Via Julia Augusta that Flavos had become a Roman citizen. Close up showing the top of a Corinthian capital with a eagle relief above it to the right, and the foliate pattern across the entablature. 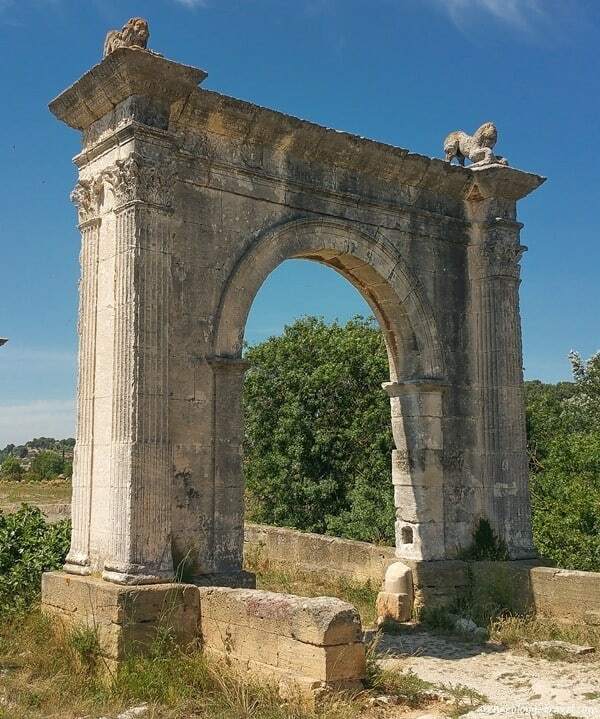 Although this is the only Roman bridge with triumphal arches at either end, it is thought they existed elsewhere. Representations of bridges like Le Pont Flavien have been found on coins from the first century BC. No date is recorded on the bridge, but the style of the foliate decoration suggests it was probably built sometime around 20 or 10 BC. The bridge was on the Via Julia Augusta, a Roman road that linked Placentia in Italy to nearby Arles, and was still in used up to 1949. Deep ruts from the wheels of carts are clearly visible in the ground on either side of the bridge – leading up to and away from the bridge. The centuries of traffic from Roman times to the 20th century have worn right through the surface of the road that covered the single barrel-vaulted archway. The rutted rocks on the bridge are not Roman, but replacements that date to the restoration of the bridge carried out in 1763 by Jean Chastel. The northern arch collapsed again during the second World War when a German tank ran into it, followed afterwards an American truck that finished it off. Again the arch was reassembled, but the decision was taken to close the bridge to traffic and a by pass was built. 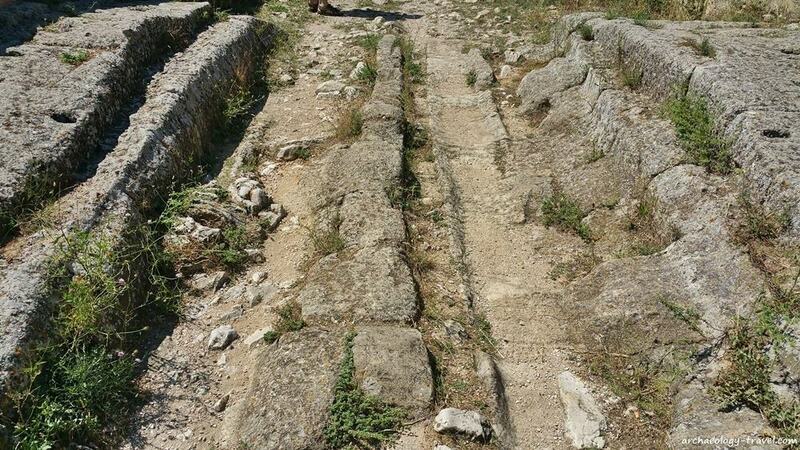 Since the end of Antiquity carts were digging deep ruts into the arch stones of the bridge. Rut marks made by cart wheels leading away from, or to, the bridge on the northern bank. Where is Le Pont Flavien? The bridge is freely accessible on the D10 south of St Chamas, about 37 km west of Aix-en-Provence. The position of the bridge is indicated by the red marker. As this map is looking down on the bridge, you get to see the two triumphal arches at either end of the bridge through their shadows. The cart tracks are clearly seen on the northern side of the bridge; the road leaving the bridge forked. Click on the red marker to get the option of having directions to or from the bridge provided. You can also zoom in and out on the map. What do you think, is this the most beautiful Roman bridge outside of Italy?